I’m going to get the ball rolling this morning with a warning: you will be sick of seeing this hairstyle by the the time April is out. Outfit photos and videos have all been shot with the double halo braid on my head – so sorry not sorry in advance on that one. Everyones seen a halo braid before so this is nothing new, but I thought I’d pop up some photos today as I realised over the past weekend that, with my mid length-y/growing out locks, I’d have to get a little creative if I wanted to actually pull off halo braids on myself. Anyone with shorter hair will know that one braid on each side just wont even reach the top – especially without shorter layers poking out left right and centre. So I decided to split my hair into four parts. Front sections and back sections. Doing this allows me to get the full looping over of the braids at the front, but still keeps the shape at the back of the head that the rear braids create. The braids at the back only just meet – so I made sure I had a fair few hair pins in a colour that matches my hair to keep them in place. If you want to see a tutorial then just shout and I’ll put together a little something for ya! Looking gorgeous with this hairstyle! Tutorial please? I have hair your length, and I just can't seem to get the braids to meet! Definitely want a tutorial! I have hair the same length as yours with no layers and would love to see how you do the double-up. I do a single halo but not sure how the double one works 🙂 Beaut! I would love a tutorial Suzie! A tutorial would be fab – it's such a beautiful hairstyle! I think my hairs still a little too short for this which is a shame! Looking especially gorgeous in the second photo suzie! This is a great look. I'd love a tutorial, as I am also growing out my hair and never know how to style it. I love this! You look gorgeous with that hairstyle, I don;t think I could pull it off though. Very lovely look! I'm awful at braiding and have attempted halo braids before with no luck. I'm planning on getting a short bob so there goes any future attempts, haha! My hair is medium-short length right now (and layered) and I'm currently try to grow it back out (I used to have really long hair, and now I'm seriously missing it). Anyway, I try all the time to braid my hair now and small pieces are constantly sticking out this way and that! I'd LOVE to see a tutorial for this style! Thank you!! I absolutely love your double halo braids. It adds something different to the normal halo braid. 🙂 I'd love to see a tutorial! I would love a tutorial on this! Looks lovely. I would love to see the tutorial! 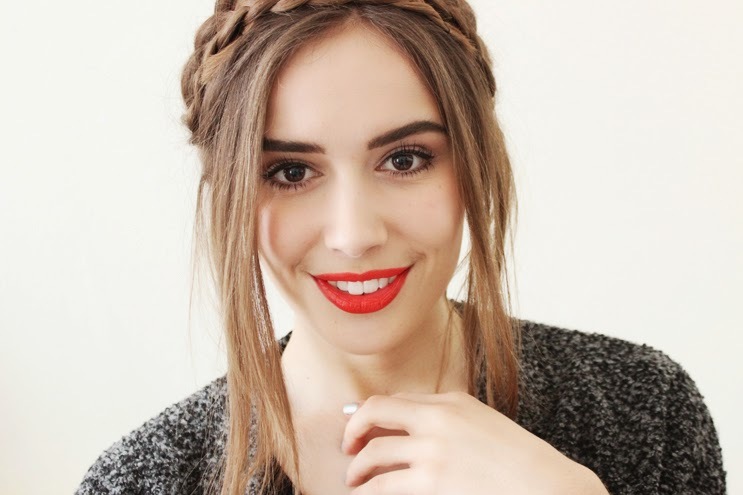 The halo braid look, looks amazing on you! This is absolutely gorgeous! 🙂 I wish I changed it up a little more with my hair. I think I may need to take the time to try this out very soon. I love this look on you! Especially the pieces that frame your face–I have super long hair which I don't think would suit letting pieces out but this has inspired me to play around a bit! A tutorial would be lovely <3 Also, you look so much like Lily Collins here (I know you get that a lot but still!). Its fine! Keep wearing them they look great! Would love to be able to do this with my hair! Would love a tutorial! Also, your brow game is strong, love it. I'd really like a tutorial for this one. Please? I'd love to see a tutorial of this! I have in between length (and rather fine) hair which I love and hate with equal measure as it's so hard to find fun up-do's that aren't just a donut bun!